The Rochester Historical Preservation Society is dedicated to remembering the town’s notable history, celebrating the present, and preserving it all for future generations. Our members include people from every walk of life, who are united together in their love of the Rochester community and desire to make it an even better place to live. The Rochester Historical Preservation Society was founded in 1988 when Mel Creviston, a local contractor, was razing a house on the property of the Rochester Christian Church on South Walnut Street in Rochester, Illinois. Beneath this structure he discovered an intact log house. This log building served as the impetus for a group of people to form a historical society whose goals included: 1. researching the background of the newly found log house, 2. gathering and documenting the history Rochester, Illinois, 3. building an organization that would feature programs pertaining to an historical nature, 4. raising funds to restore historical structures, and 5. providing an avenue to preserve our history for future generations. 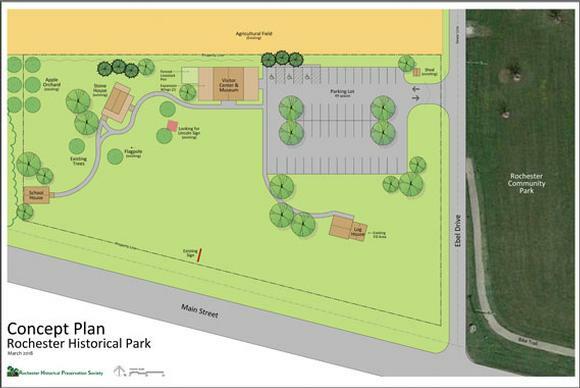 Through dedicated efforts of a multitude of people, funds have slowly accumulated, and the society envisioned a recreated historic settlement on land adjacent to the Rochester Park. The emphasis shifted from restoring the log house to reconstructing a stone house which was donated by the Chester Mendenhall family in 1997. 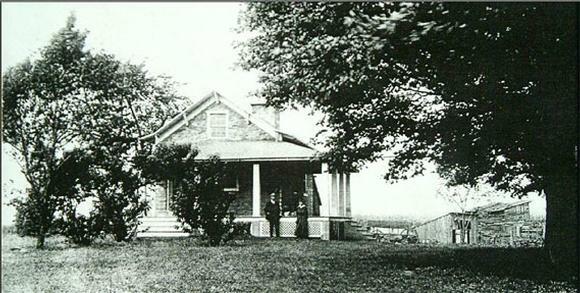 The stone house, dating from the 1830’s was originally located on the Buckhart Road three miles east of Rochester. Due to some storm damage the house was falling down and becoming a safety hazard. A group of men disassembled the house and moved the stones to the site of the Rochester Historical Village on west Main Street also known as the Lincoln/Van Buren trail. This site is also less than a mile east of the location of the historic first sawmill and schooling facility in the Sangamo country; the Clark brothers mill on the South Fork River. A Springfield stone mason named Wymond Stubbs laboriously worked with a pile of stones scattered around the building site and began rebuilding the house. David Grubb served as construction superintendent and spent countless hours of personal labor, plus assisting in coordinating other workmen in making this reconstruction a reality. Meanwhile, other members of the RHPS looked toward the goal of making it a home to reflect the life of the early settlers who lived there: Lucetta (Putnam) and Samuel Stevens, and later Lucetta with her second husband, Samuel West. Research has shown that a young lawyer in Springfield, Abraham Lincoln, helped Lucetta with her estate after Samuel Stevens died. An acquisitions committee was formed to search and locate appropriate furnishings for the period of early to mid-1830s and to accept donations from people who had special pieces to share. The programs and projects of the RHPS would not be possible without financial support. In the fall of 2005 a tiered giving program was implemented. Contributions made to the organization through this program are tax deductible and are very much appreciated by our group. A copy of the program form is available for your convenience. Each year, children from area schools take field trips to the Stone House in May. Docents portray real Rochester pioneers and discuss the history of Rochester and the Stone House. You are invited to join the RHPS as they continue their work. The historical village is free to visit any time. Access to the inside of the house is by appointment. The house is open from 12 – 4 pm on the first Sunday of each month from May through October. Please revisit this site periodically as we will be adding more information and pictures of the reconstruction of the Stone House during 2006 and further additions and development of the village. Becoming a member of the Rochester Historical Preservation Society is a great way to give back to the community and to include your name in the annals of its history. Simply select your preferred membership level and provide your payment information through the convenient PayPal link on the right. We’ll provide you a Thank You card comfirming your membership for the current year, which could be a tax-deductible donation. As a tax-exempt organization (number E 9941-5216-01) we are always very grateful for any donations and you may review our donation giving brochure for some ideas. In addition to monetary donations we are interested in furniture and smaller miscellaneous items that are of the 1800-1840 eras. Use the PayPal button below for secure donations.